Representatives of LEACH, the Huddersfield based graphics consultants met with Linda Chambers, Land of Iron Steering Group member and Elspeth Ingleby from the Land of Iron project team in Rosedale Abbey on Tuesday 24 July to discuss progress on the designs and placement of information panels forming the Rosedale Hub. 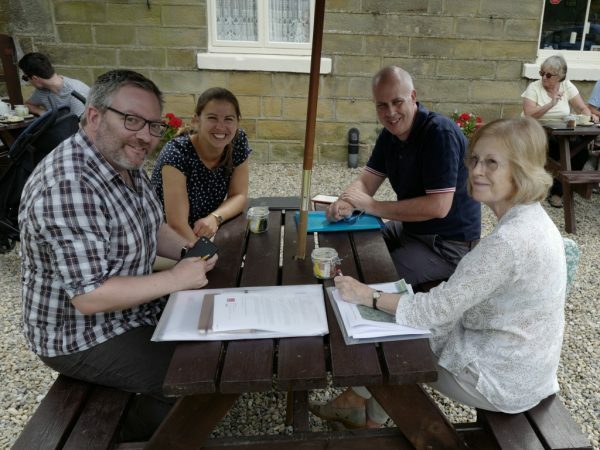 The History Society has now been tasked with providing detailed information on Rosedale’s industrial heritage sites for inclusion on the displays around the dale. Currently, it is hoped that these will be in place by next Spring to greatly improve visitor information and updates on progress will be given here.